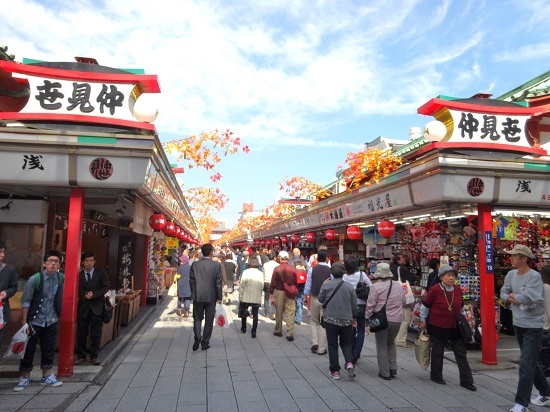 The sightseeing spot Asakusa contains many streets that are still reminiscent of Old World Japan. It is a tourist attraction full of the tourist from the foreign countries or a school excursion student anytime. 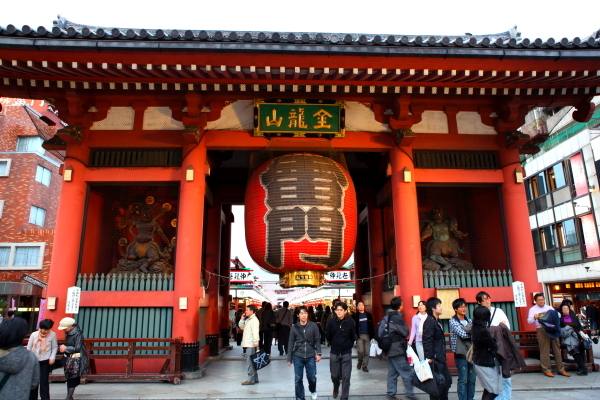 The icon of Asakusa is the Kaminari-mon Gate! Formally it is called the Fu-jin Raijin Mon. 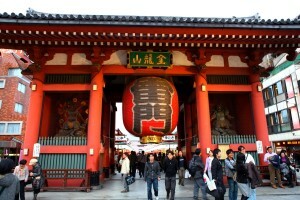 It is red, and there is an image of the god of the wind, the god of thunder on both side of the big lantern. Why don’t you start your tour off with a photo! 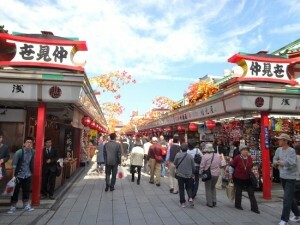 There are many souvenir shops around Nakamise Street leading up to Senso-ji Temple. Accessory, a folding fan, kimono…There are a many iconic Japanese items for sale. Many tourists come here to shop for souvenirs. Be sure to try special treats unique to Akasaka: the “Kaminari-okoshi” (sweet rice crackers) and “Ningyo-yaki” (red bean-filled pancakes). Nakamise Street eventually leads to the entrance of the Buddhist temple, Senso-ji Temple. Be sure to visit – it’s customary to purify your hands with the holy water to your left, and bathe in holy smoke before entering the main temple. 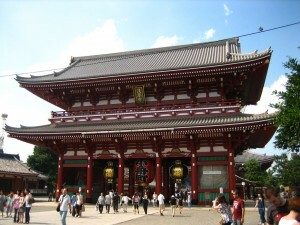 Senso-ji Temple is the oldest temple in Tokyo. There is the history more than 1,300 years! It might be fun to pull an omikuji, a paper that tells your fortune for the year. 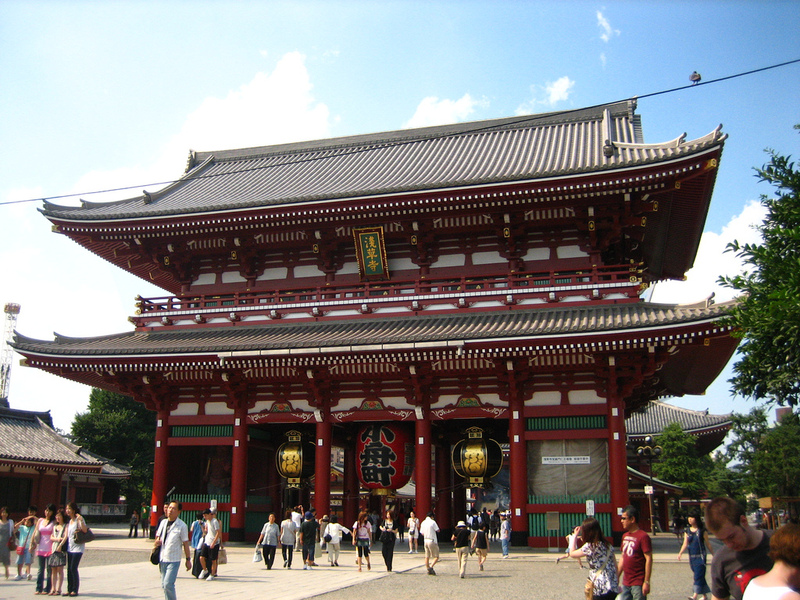 Many shrines and temples water down their omikuji to include the predictions of only good and mediocre fortunes, but Senso-ji is merciless! Here you could potentially pull a bad fortune also. In addition, various fun things are found around Asakusa. In Tokyo, it is the place of nostalgia where you can still find blocks of houses unchanged from decades prior. If you are lucky, you may even see a maiko (geishas in training)! There are many bars in Akasaka open from daytime. Hoppy is a liquor similar to beer that can be mixed with shochu and other liquors. Maybe stop in for a glass! If you want to experience the “real” Asakusa, visit the entertainment hall. 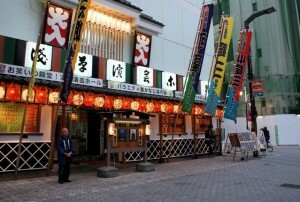 The stage features various entertainers including magicians and those performing Rakugo, a comic dialogue. There are many famous comedians who started their careers right on this stage! Asakusa is retro, as well it is international. It is the place where there is a unique atmosphere. Those who are repelled by crowds should avoid the busiest hours – during the day – and visit from evening. 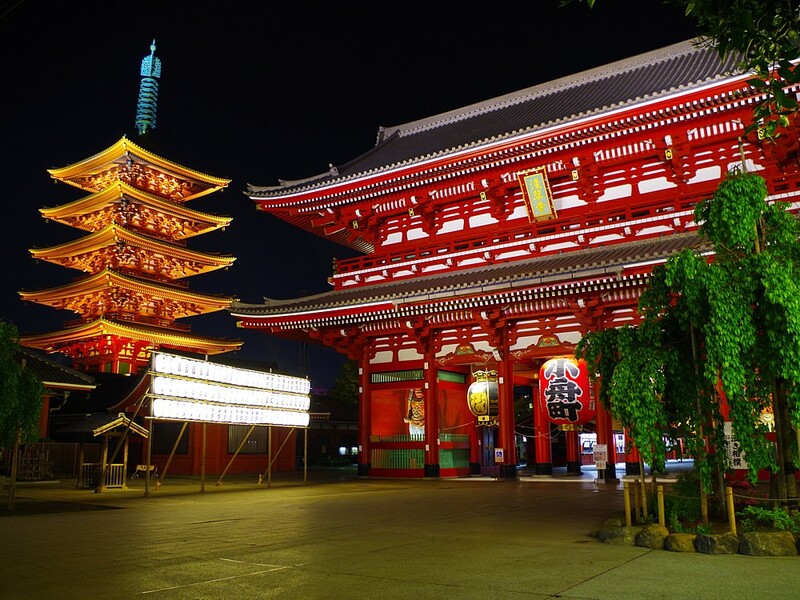 You’ll be able to see the main hall of the Buddhist temple and the Sky Tree lit up in all its glory!